Desktop virtualization provides organizations with the ability to control costs, use limited resources for large desktop infrastructures, and increase security and deployment efficiency. And as IT pros face a growing enterprise, it is important to develop an infrastructure that can handle the growth. 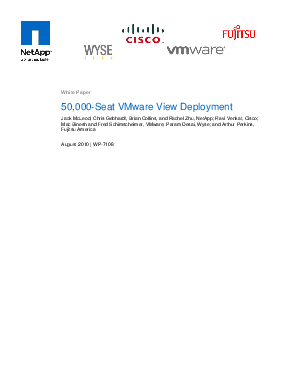 This white paper highlights an architectural design for a 50,000-seat VMware View architecture created by NetApp, VMware, Cisco, Fujitsu, and Wyse. Explore how the project demonstrates the most reliable methods for deploying a scalable and easily expandable environment, anywhere from 5,000 to 50,000 seats. Review the architectural design and receive insight on the necessary software needed for deployment, the physical server configuration, infrastructure components and more.